It will soon be officially Spring (don’t forget to change your clocks on March 11), and our February rainfall total was dismal! Let’s hope we catch up on the rain totals this month and manage to get those summer veggies planted. Weren’t the winter Olympics fantastic, what great athletes! “March Madness” will begin with the 2018 NCAA Basketball Championship to be determined in early April. Our Padres will be starting their regular season schedule in the last few days in March…with a couple of new, HIGHLY PAID, players to bolster their chances. Passover and Good Friday are on March 30 this year…some children will be looking for the afikomen, while others are waiting for the annual Easter Egg hunt at Standley Park. Plans/drawings for the Costa Verde Mall renovation will be discussed at the UCPG meeting on Tuesday, March 13, …that’s also the night of their elections for our local representatives. (See candidate’s profiles on page 3 of the March print newsletter). 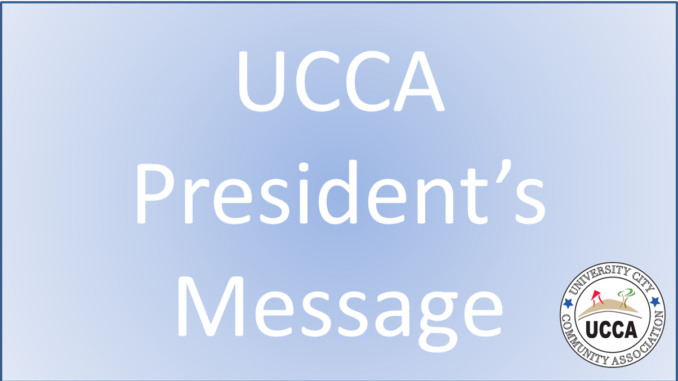 On Wednesday, Costa Verde Mall representatives will be at our UCCA meeting….so you have two opportunities to be informed and to provide your input as to their current plans. As noted on our front page March print newsletter, the Regents Road bridge and Genesee widening options have been removed from our Community Plan. Plans for a new University City Community Plan will begin this calendar year and there will a number of public meetings held. The dates and locations for these meetings will be announced later this Spring. If you missed the February “Senior Scam Seminar”, UCCA and our community library will be hosting a second session provided by CA Assemblyman Todd Gloria’s office at our library on March 16.